Although many of the nearby stars we will study for signs of life are older than the Sun, we do not know how long it takes life to emerge or, for that matter, how likely it is to emerge at all. As we saw yesterday, that means plugging values into Drake-like equations to estimate the possibility of detecting an alien civilization. We can’t rule out the possibility that we are surrounded by planets teeming with non-sentient life, fecund worlds that have no heat-producing technologies to observe. Fortunately, we are developing the tools for detecting life of the simplest kinds, so that while a telescope of Colossus class can be used to detect technology-based heat signatures, it can also be put to work looking for simpler biomarkers. Svetlana Berdyugina (Kiepenheuer Institut für Sonnenphysik and the University of Freiburg), now a visiting scientist at the University of Hawaii, has been leading a team on such detections and spoke about surface imaging of Earth-like planets at the recent Breakthrough Discuss conference. The emphasis was on Proxima b, but these techniques can be applied to many other systems within the 60 light year radius that Colossus should be capable of probing. Studying exoplanets in different orbital phases allows us to acquire a surprising amount of information, using techniques that have already been deployed for the study of the surfaces of stars. We have to take into account factors like clouds, seasonal variation in albedo, and the variability of the host star as we consider these matters, but given the signal-to-noise ratios that the specs for a Colossus-like telescope imply, we should be able to discern not only variations between land masses and oceans but the photosynthetic biosignature of local plant coverage. Berdyugina’s team includes Jeff Kuhn (University of Hawaii), and university colleagues David Harrington and John Messersmith, along with Tina Šantl-Temkiv (Aarhus University, Denmark). The idea they have explored in a 2016 paper in the International Journal of Astrobiology (citation below) is to use the properties of light to detect photosynthesis. We use these facts already in studying our own planet through Earth-observing satellites like Landsat, which can map changes to Amazon forest cover by imaging in multiple bands falling on either side of the ‘red edge.’ I also note work from Giovanna Tinetti (University College London), which estimates that 20 percent of a planet’s surface must be covered by plants and free from clouds in order for the imprint of vegetation to show up in a global spectrum. It will be interesting to see whether, as it continues to develop, Berdyugina’s work agrees with this figure. But back to the paper. The key to the work is polarization, the oscillation of light in certain directions as opposed to light that oscillates in all directions at once. We learn that the infrared light reflected by a leaf is polarized nowhere near as markedly as the visible light reflected off it. This means that polarizing filters can be used with sufficient contrast to detect biopigments, each of which, like chlorophyll, has its own signature in polarized light. Moreover, the current work shows that polarized light can distinguish clearly between the biosignatures of photosynthesis and light from oceans, minerals and atmospheres. Image: A green leaf absorbs almost all red, green and blue light (RGB), but it reflects and transmits infrared light (shown in grey). 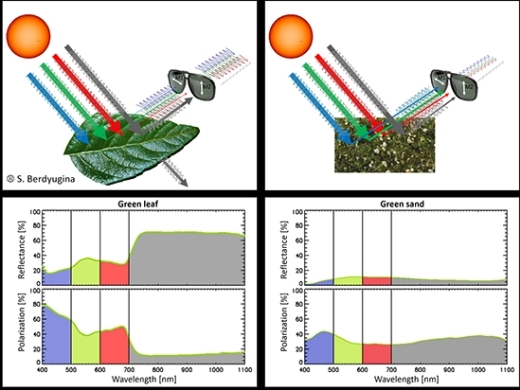 The reflected infrared light is only weakly polarized due to the reflection of a healthy leaf, but the reflected RGB light is strongly polarized due to biopigments. Measuring the amount of polarized light at different colors reveals the signature of the leaf biopigments. Green sand reflects and polarizes sunlight almost equally in all wavelengths, which distinguishes it from a leaf that is a similar color. Similarly, yellow plants are different from yellow sand, etc. Credit: S. Berdyugina. In their 2016 paper, the researchers discuss their development of a detection mechanism based on polarimetry, working with a laboratory experiment measuring the optical polarized spectra of samples both biological and non-biological. The paper investigates a range of biomolecules that capture stellar photons and store their energy in chemical bonds, examining plants with various pigments and likewise measuring non-biological materials like rock and sand. The results, drawn on modeling of the polarized spectra of Earth-like planets in a variety of configurations — degree of surface coverage by photosynthetic organisms, empty land areas and ocean — show how useful polarized spectra can be at detecting photosynthetic pigments. Bear in mind when considering future observations that even with upcoming giant telescopes, we will not be able to image a planetary surface directly. Instead, we will use changes in the rotational signature of the planet as it moves about its star to learn about surface properties. It is feasible that the contrast down to 10–8 can be achieved with the current technology. However, to collect the necessary amount of photons in order to achieve such a high contrast for small planets requires extremely large telescopes. It appears that 25–40 m telescopes will be able to see only a few such planets. Large telescopes, such as the 75 m Colossus telescope are needed to investigate hundreds of Earth-like planets in stellar habitable zones (Kuhn & Berdyugina, 2015), but even such large telescopes will be able to detect their light with a sufficient SNR at very low spectral resolution or in broad bands. The fact that absorption and polarization features of biopigments are extremely broad allows for filters designed to provide enough detail on their possible photosynthetic origin. Such filters give us, in other words, a tool that can distinguish a living from a non-living world. And not just in terms of vegetation. The paper goes on to note that the same biosignature is produced by bacteria and archaea, both of which use biopigments to harvest stellar light, as well as to protect themselves from dangerous UV radiation. Applying the techniques in this paper to the study of microorganism signatures through polarized light is an ongoing project. It is worth also to note that a lack of blue photons in cool M stars will probably require a more complex mechanism for splitting water molecules into hydrogen and oxygen involving three or four photons instead of two as it occurs in terrestrial organisms. Therefore, understanding properties of radiation reflected from various photosynthetic organisms may help to identify such life forms on distant planets. This is the primary goal of our study. The paper is Berdyugina et al., “Remote sensing of life: polarimetric signatures of photosynthetic pigments as sensitive biomarkers,” International Journal of Astrobiology 15 (1): 45-56 (2016). Full text. I like this polarization idea. My question: is it a feature of terrestrial photosynthetic pigments or a feature of any possible biochemistry? This may be important as photosynthesis was only evolved once on Earth, possibly relatively late after biogenesis (but we don’t know), and plants integrated the photosynthetic organisms as chloroplasts. It might therefore be hard to evolve and therefore relatively rare. Other biochemistries may have come up with a different mechanism to utilize their star’s energy. As with the heat signatures idea, this approach could be tested with a remote probe in deep space to determine if it really works on Earth and a test against Mars showing a clear difference between a living and dead world. Here is an interesting article on photosynthesis, putting its emergence very early, 3.5-3.8 billion years and very widespread. We can pretend this link was in the original comment. Photosynthesis evolved multiple times on Earth simultaneously from various UV protection mechanisms. Well, the chlorophyll in chloroplasts doesn’t bear a great deal of resemblance to the photosynthetic pigment in some bacteria, indicating that they may not be a common evolution. And there’s even a photosynthetic insect, that uses a third type of pigment. I’d say it’s safe to say that photosynthesis probably did evolve at least several independent times on Earth. So, yes, it’s a serious question whether alien photosynthesis would lead to the same clues that Earthly photosynthesis does. Were you thinking about bioluminescence by any chance? As for your first question it seem to me that their study only have addressed one type of vegetation on Earth, while we already got several other kinds. Even if chlorophyll is used by the vegetation on a distant planet- and we don’t even know that – the alien vegetation might incorporate other pigments depending on the conditions there which could mask any signal. We see a bit of different colours already on Earth. High altitude vegetation that tend to be bluish, to ward off UV and higher energy photons. Lichens in arctic areas sometimes are black to pick up at much as possible regardless of wavelength. Yet don’t have any really good example on Earth where the vegetation come in any other colour, (though red and brown plants exist)…. But yes I fully agree they should have included not just a grass, but also algae and moss – perhaps even lichens. That would make a possible detection more likely. Anyway, I don’t think chlorophyll is the last word on amassing energy from light, there might be other processes developed by life elsewhere. And it would not surprise me if those will turn out to be more efficient. I would definitely have included algae. This might be especially important if the idea that planets are either dry or water worlds is true. Then we might not expect to see just terrestrial plants, but aquatic ones. On Earth, those are dominated by algae of various forms. These use different chlorophylls, often depending on depth. For example, red algae capture the blue light that is least absorbed at depth. Then evolution generated other forms, of which ferns became quite dominant. One might think that a fern or two was available on the grounds in Hawaii. On Earth, accessory pigments provide color to the green plants. These provide many of the leaf colors that are not green. I think that the authors used petals that contain these pigments for their experiment. That’s why I said “natively”; It doesn’t really imply a separate evolution of photosynthesis if you’ve got a photosynthetic symbiont. Alex makes a good point that photosynthesis – as we know it – may be very rare, which would make this akin to searching for a needle in a haystack. I’m a proponent of gathering as much data about what we can see in extant exoplanets and trying to determine what this data means, rather than searching for something we already know. Are exo-organisms on red dwarf systems capturing energy somehow from infrared frequencies and what chemical signatures would this evince? Recall that CD post ((The Blue Spectres of Abyssal Europa) that included the evolution of bioluminescence. If bioluminescence is so easily evolved, in contrast to photosynthesis, perhaps we need to look at their spectral characteristics as well? They are a start in potentially capturing light, which might then be harvested and fixed in chemistry. While collecting data is important, it does help to have some hypotheses to hang the analysis on to start. However, we may be surprised at what we find, so it is important not to be too focused on looking for analogs of Earth life. We may miss recognizing a very different life form. If it isn’t practical for plants on such worlds to use an essentially “differently-tuned” version of photosynthesis as we know it (perhaps infrared light doesn’t carry enough energy for such plant chemistry to be worth developing? ), maybe plants could still get their energy from infrared light via other methods. For example, black leaves (perhaps with light-transmitting but heat-trapping “greenhouse layers”–maybe even with clear-tissue linear concentrator lenses on the leaf surfaces, for plants in colder latitudes or “twilight longitudes” on tidally-locked worlds) might get warm enough to drive alternative “thermosynthesis” reactions, if an infrared variant of photosynthesis wouldn’t be worthwhile, energy-wise. The answer is no. This is because IR is too weak an energy source. The only places where IR would be the energy source might be in a lava tube, an unlikely place for life to exist. Typically low light levels are found at depth in the oceans. Blue light, not IR is present. AFAIK, IR is only used as a sense organ, for example by pit vipers. This organ uses a different sensing approach to the pigments in eyes that respond to visible (and UV) light. I was thinking of plants–possibly microbial ones such as bacteria–living in crevices of exposed rocks in places like the arctic and/or the antarctic. With sunlight being weak, briefly available, and indirect at best for them (especially during the winter), I could see them perhaps utilizing all of the available wavelengths in what little sunlight they get (from infrared to UV A) for photosynthesis. While bacteria do live in places such as lava tubes, they usually are types that don’t perform photosynthesis, but instead “leach” minerals they need out of the rocks. Bear in mind that some eyes evolved from light sensitive surfaces, then pits. They have no resolving power either. NIR might be practical for eye size, but not for FIR. OTOH, suppose a large organism used many distributed IR sensors and integrated those into an image, not unlike the LOFAR radio telescope concept? Regarding extending the spectrum in weak light environments. Consider that the organism must allocate resources to harvest light. Green plants just increase the number of chloroplasts in dim light. Given the choice – make more compounds to harvest the high energy light or use compounds to harvest a lower amount of low energy light, which is more likely to work, and therefore be selected by evolution? A “just so” story I know, but I think it is valid in this case. Far infrared merges imperceptibly into radio. While it’s not impossible that some living things, somewhere, might utilize far infrared (or even radio) for sense organs, they wouldn’t be eyes. A distributed-sensors image-making system could conceivably work even at visible light and ultraviolet wavelengths (strangely, before I turned on my computer I was just reading about Pioneer 10’s and 11’s spin-scan imaging photopolarimeters, which produced images but were not at all like cameras). “Exoplanet biosignatures : A review of remotely detectable signs of life ” , Swieterman ,Kiang et al was published in the arXiv on the 17th May. It is a very comprehensive review of the subject that explores photosynthesis and chemosynthesis in detail along with their various pigments , accessory pigments and potential variations according to stellar class , “red edge” and theoretical other wavelength edges too . Despite being long it is a good and contemporary read . One of the reasons that photosynthesis only arose once is that it is the ultimate chemosynthesis process , efficiently harnessing stellar energy direct . What could beat such a great thing? I was surprised to find that there is still a lot NOT understood about it. Thank you for your interest, great questions and comments! Right now we study algae and bacteria, different kinds. Indeed, we may expect simple organisms like algae and photosynthetic bacteria to be more common than plants on other planets. However, their biopigments are basically the same, and the results we have obtained for plants are similar to those we see in bacteria and algae. This paper is in preparation, so you will hear about it soon. Also, we do study plants from different environments – with high UV and low illumination. This is all in work right now. Thank you for being so foreseeing! As concerns bioluminescence, it is really beautiful, but it occurs in very narrow bands. So, detecting it on distant exoplanets will be more challenging that broad polarized bands of biopigments. Again, we have to start from something . Earth is the only planet with life we know. Yes, we should be able to think broadly, so photosynthesis is not the only signature of life we look for. But it is one of the most prominent on our planet! And its general spectral characteristic, independently of the pigment – very broad and highly polarized absorption band near the maximum of the stellar flux. This is verified with plants (published), algae and bacteria (in prep.) and what we will search for on exoplanets, along with other biosignatures, such as water, oxygen, methane, or any other gases in disequilibrium. That statement surprised me. A quick search of the literature did not turn up any papers to clearly support this. e.g. “Early Evolution of Photosynthesis” (2010) R.E. Blankenship. The core chemistry looks like it was evolved once, even though the simpler antenna systems did evolve many times. I would, therefore, modify my statement to be that photosynthesis is hard to evolve independently, unlike, say eyes, which have evolved independently many times. I am not a botanist, so I will take your word for it. It wasn’t used in any of the papers I looked at regarding the evolution of photosynthesis. I certainly didn’t mean to imply your work is not of value. As I said before, this polarization idea is very interesting. I hope that you can test it on the one known planet that has chlorophyll by observing it from a great distance to confirm the signature you are looking for as a base case to compare with. Perhaps you have ideas on how this may be done relatively quickly and at low cost. Earthshine (earthlight reflected off the dark moon) photometry, polarimetry, and spectroscopy has been used to test and see “exoplanet” biomarkers. Google “Palle earthshine” for reviews and refs. Thanks for the hint. However, the issue is using te approach for very faint sources. Successfully adding polarimetry to spectral observations “is quite a big deal,” says Christoph Keller, an astrophysicist at Leiden University in the Netherlands who wrote an accompanying News and Views article in Nature3. Nevertheless, he notes, “no one will be able to do this for exoplanets for quite a while”. Sterzik agrees: “Using this technique [to observe exoplanets] is not within reach with current technology,” he says. For distant — and therefore exceedingly faint — targets, such measurements would require long exposures through much larger telescopes than are now available. Sterzik and his colleagues suggest that the next generation of telescopes — including instruments such as the European Extremely Large Telescope, which will have an aperture nearly 40 metres across and could be operational about a decade from now — could make observations that reveal that Earth is not the only planet hosting life. It was possible to see the “red edge” signature and also other life signatures. There are also continuous observations of the Earth surface from near space satellites (e.g., NASA NEO). There are lots of spectral and some polarimetric data (e.g., POLDER mission) for various types of surface features, including grasses, different kinds of forestry, etc. The strongest life signature is “red edge” of plants on covering land masses. Signatures of algae in the ocean is very difficult to see. All these data we use for modeling possible signals from exoplanets. The issue isn’t whether this can be done from space near Earth, but whether it can be done for a very faint exoplanet signal. If the intensity is reduced to that of an exoplanet signal, then a faint, point source signal even from Earth orbit using direct signal or Earthshine on the Moon would prove the technique can be used for exoplanets. The reason I used the link I did was because the author stated (in 2012) that the technique wasn’t yet doable for exoplanets, and that a larger scope was needed. If your argument is – build the scope and we can do this, then fine. My comment was predicated on testing the technique first by other available means to confirm that a larger scope would allow this technique to do the analysis. As a biologist, I would be thrilled to see definitive, unambiguous detection of a biosignature. It would be a great driver to try to build instruments to image these worlds in greater resolution and eventually send probes. Exactly. That’s why we need ELF or Colossus. Thanks for your remarks and seminal work. The most shocking thing about photosynthesis for me , was not how many times it has arisen , but the PSII process you describe which contains the most oxidative ( and amazing ) biomolecule known in nature , the so called Oxygen Evolving Complex – OEC . Sufficently strong , crucially , to break down a water molecule and start the whole electron transfer process off. Incredibly efficient . Shocking too that it’s 4 Mn atom/ Ca and Cl cofactor structure despite its importance was only constrained by crystallography as recently as 2011! Even more amazing is that the way in which 02 binds is still not understood AND that with no primitive precursor molecules yet found, its formation is not known . Surely the root cause of the genesis of photosynthesis on this planet to say nothing of the vital role and incorporation of trace elements like manganese ( and molybdenum , zinc et al ) in the development of critical biological pathways . A sure sign too I suspect that similarly functioning bio molecules on exoplanets will likely be different in nature if not action according to availability of these elements at pivotal moments . I like the idea that biopigments of plants polarize light through reflection polarization, so that we can differentiate that light from the non polarized light other non living materials sand, dirt etc which are not polarized. Also the light from an exoplanets atmosphere is polarized through scattering polarization which allows us to distinguish it from the non polarized red light of an M class dwarf. Thanks . Great spot. A magnificent insightful article , relating energy use to the evolution of life on Earth (yet strangely atavistic in being reminiscent of the old Greek idea about the basic elements of Earth, Wind , Fire and Water ) . It could also have been entitled ” The War on Entropy” -Woe ! or more optimistically , “Water harnessing , oxygenation , animation “- Whoa ! Paul, I wondered if you thought it worth approaching Professor Judson to write a supporting essay ? This is a seriously “blue sky” thinking. Ashley…thank you for your comments. Your thoughts reflect mine. I am only an amateur astronomer, even if for 60 years worth, so I hardly claim to be a professional in this field. Yet I must admit I was taken back by the processes discussed in the article by Professor Judson and would be desirous of reading more about it from other people more capable than myself. Yes, Im in a similar boat and felt exactly the same. I forwarded it to several academics I know who were equally impressed too and intend to use it and it’s huge number of references . I was able to speak to Dr Judson herself , who feels the rate limiting step is to whether oxygen producing life , be it by photosynthesis or some other chemical process , can produce enough O2 to benefit from the energy it offers . Bearing in mind the billions of years on Earth from the first photosynthetic Cyanobacteria till the “Cambrian Explosion “. James Kasting ( Penn State U) -who I consulted on this – has looked in detail at the build up of atmospheric O2 using sulphur isotope studies and has also just published “Atmospheric evolution on inhabited and lifeless worlds ” with David Catling ( Washington U) which is aimed at graduates but still within the grasp of enthusiastic , well read amateur geoscientists & astrobiologists . It dovetails well with the Judson work. We provide an overview of the prospects for biosignature detection and general characterization of temperate Earth-sized planets. We review planned space-based missions and ground-based projects as well as the basic methods they will employ, and summarize which exoplanet properties will become observable as these new facilities come on line. The observational strategies depend on whether the planets are transiting or not as well as on the spectral type of the host star. There is a reasonable expectation that the first constraints on spectroscopic features of atmospheres will be obtained before 2030. Successful initial characterization of a few nearby targets will be an important touchstone toward a more detailed scrutiny and/or a larger survey to address statistical questions such as the occurrence rate of habitable environments. The broad outlook which this paper presents may help develop a framework to evaluate the possibility of biospheres based on the observables, and consider new methodologies to characterize exoplanets of astrobiological interest. Technological civilizations may rely upon large-scale photovoltaic arrays to harness energy from their host star. Photovoltaic materials, such as silicon, possess distinctive spectral features, including an “artificial edge” that is characteristically shifted in wavelength shortwards of the “red edge” of vegetation. Future observations of re-flected light from exoplanets would be able to detect both natural and artificial edges photometrically, if a significant fraction of the planet’s surface is covered by vegetation or photovoltaic arrays respectively. The stellar energy thus tapped can be utilized for terraforming activities by transferring heat and light from the day side to the night side on tidally locked exoplanets, thereby producing detectable artifacts. We’ve never had a better chance of finding extraterrestrial life — if it exists. We never seem to learn: “…the dynamical conditions for building planets in protostellar nebulae rely on a finely tuned “sticky” accretion process to yield intermediate protoplanetary objects that are large enough for gravitational accretion to make planetary-size bodies…thus, planets in other stellar systems must be exceedingly rare.” … is the seemingly well-reasoned statement I heard from more than one notable astronomer 40 years ago. By the nature of our business, it appears that we scientists have a maddening ability to “inadvertently” place ourselves at the center of the universe — not appreciating until later that this place is just the center of the “known universe”. So is this “rare earth” notion — that “the condition for (intelligent) life requires too many miracles to be commonplace” — another example? Consider this magic story…. Not having studied the “science” of magic you might be impressed if I came to you with a deck of cards. I fan them, then ask you to pick and hold a card. After some small manipulation I shuffle and hand you the deck. When asked to look at the top 3 cards you will find that they are the remaining suit cards with the same numerical value as the card you picked…”simply by shuffling the deck”. What are the odds of this! Contrary to your understanding of probability you would find that every time we repeat this “experiment” we get the same outcome — it is not rare. Of course this is not magic, and we haven’t violated any laws of physics. Its another “known universe” problem. For the case of the evolution of life I would argue that there are already too many miracles right here on earth, like….how did autocatalytic RNA ever come to be, how did DNA as an evolutionary coding scheme evolve from RNA…how did the transition from prokaryots to eukaryots occur…or the development of multicellularity…or the unlikely evolutionary occurance of photosynthesis? The possibility of life even here on Earth given the list of magical essential transitions is daunting, seemingly oh so rare, even given the number of planets in our known universe. Yet, I suspect that it isn’t that we’re the unlikely beneficiaries of a probability calculation that terminates with us as the only living example, but that the “unknown universe” is much bigger than we think (without violating any laws of physics). We need to look more carefully for the essential sleight of hand which could make life as unlikely as the “rare possibility” of exoplanets around other stars. I like your analogy. Regarding life, we know that life started relatively quickly after the Earth became habitable. This implies that either life processes were relatively easy to get underway, or that life may have arrived from elsewhere. However, eukaryotes, and later, multicellular life took billions of years to evolve on Earth. While simple multicellularity looks relatively simple to evolve it didn’t. The Cambrian explosion that saw the rapid emergence of all the main phyla and that is fairly recent in the history of Earth. Using your deck of cards analogy, the set of dealt cards might be relatively rare for such life forms that the Cambrian (or earlier) evolved. If this is reflected elsewhere, we can expect life to be common, but mainly protist, or single-celled eukaryotes. Large life forms might be somewhat rarer. So most planets won’t have forests teeming with animal life. If that model is correct, then as we discover life on exoplanets, there should be some correlation between their age and such life. [Surface life on Earth may only have a billion or so years left as our sun gets hotter.] Life may prove more versatile than that on terrestrial planets in the HZ, for example, in subsurface oceans of icy moons. I wouldn’t rule it out, but I will wait for evidence to prove it exists, at least in our solar system.